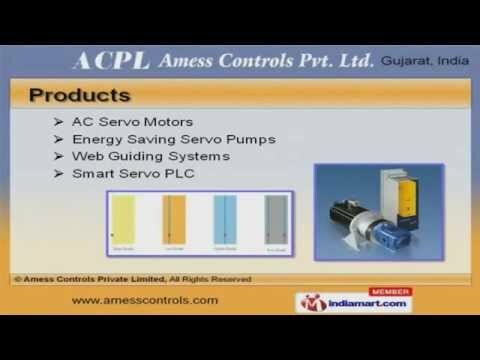 Welcome to Amess Control Private Limited. Manufacturer and Trader of Industrial Automation Products. We are an ISO 9001:2000 certified company, incepted in 1994, at Ahmedabad. We have spread our wings to North America, Western Europe and Africa. Star Technocrates Private limited and Sanket Packseal Machines Private limited are some of our elite clients and we are backed by Enthusiastic and energetic workforce. We offer a vast range of A C Servo Motors, Web Guiding Systems and Smart Servo P L C. Our Servo Driven Web Guide and Tension Control Systems are acknowledged for their functionality. We offer Servo Systems for Plastic Bag Making and Metal Profile Cutting Machines that are well known for their durability. Servo Systems for Lebelling and Blister Pack Machines offered by us are best in the industry amongst others. Along with that we offer Complete Servo Panels for Plastic Bag Making and Automation for Band Saw Machines. We also provide CNC Controllers for Lathe and Milling Machines that are cost effective.